Before returning to work for the first time, employees paid their respects at a memorial to the four people that were killed in Sunday's shooting at a Waffle House in Antioch, Tenn.
NASHVILLE - The Antioch Waffle House, site of a mass shooting on Sunday that left four people dead, has reopened Wednesday. An employee said 100 percent of the profits made at the Waffle House on Murfreesboro Pike for the next month will go to the victims’ families. 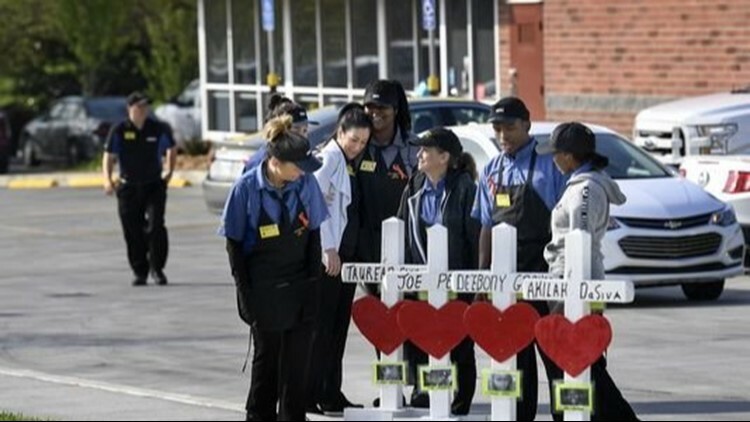 On Wednesday morning outside the Waffle House, four white crosses paid tribute to the four victims in the shooting: Taurean C. Sanderlin, 29; Joe R. Perez, 20; Deebony Groves, 21; and Akilah Dasilva, 23. Waffle House officials said they plan on creating a permanent memorial in the near future at the Antioch location to honor the four. Travis Reinking, 29, is accused of killing four people and injuring several others in the Sunday morning shooting that set a city on edge and drew international media attention. He was arrested Monday afternoon and charged with four counts of criminal homicide. On Tuesday afternoon, police added four counts of attempted homicide and one count of having a firearm while committing a dangerous felony.